Soldier 76 is one of the most familiar and standard heroes within overwatch. Soldier 76 has the ability to Heal himself and other friendly heroes near him, this gives him a huge advantage over other offensive heroes who have more selfish abilities. The general strategy for Soldier 76 is to deal damage from a distance, placing down your biotic field for healing once and while even if it’s just for your teammates. Even though soldier 76 has lots of strengths he also has his weaknesses, these come ni the form of Soldier 76 counters. Heroes like Roadhog and Genji make for some the best Solider 76 counters in overwatch. 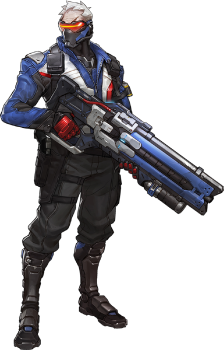 A reliable source of steady dps, a strong AoE heal, and an occasional rocket burst damage make Soldier: 76 the very good offensive hero. Alongside a Reinhardt or any other frontline hero, 76 can push or protect objectives with relative ease, all while pressuring snipers and annoying Pharahs in the sky. Genji: has the best chance out of the offensive heroes of destroying Soldier 76. Gap close along with a deflect for his Helix rockets damage can easily kill soldier 76 in a split second. Genji is one of the best Soldier 76 Counters. Roadhog: Can heal the damage soldier 76 inflicts upon him, while having the ability to hook him if he gets too close. A good roadhog is the best type of soldier 76 hero counter.